MSRP $377,890. 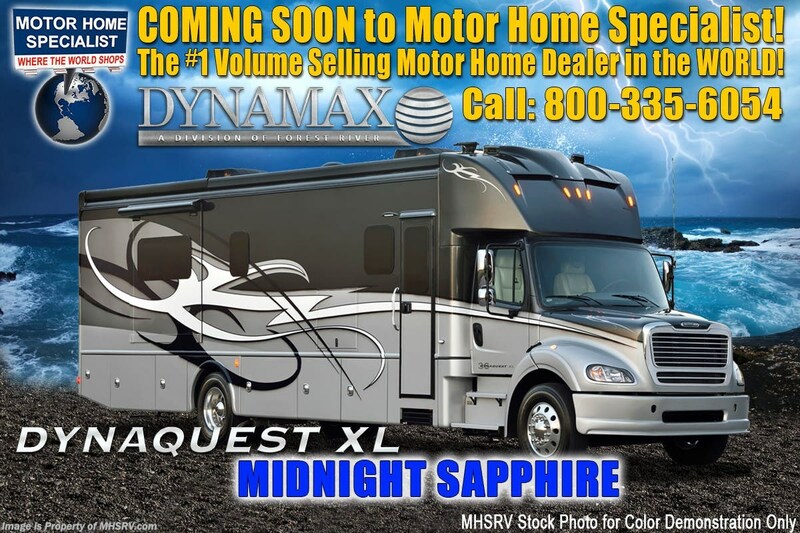 New 2020 Dynamax Dynaquest XL 3801TS. This diesel motorhome is approximately 39 feet 2 inches in length and features 3 slides, king bed, Freightliner M2-112 chassis and Cummins 8.9L engine with 450HP and 1,250 lb.-ft. of torque. 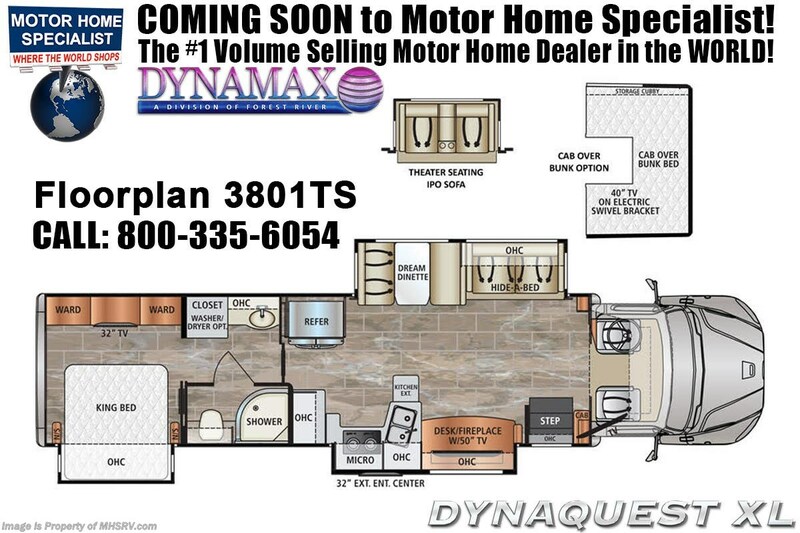 The Dynaquest XL is the perfect combination of brute force and refined living space in a Super C package! Options include solar panels, washer/dryer and dual reclining theater seats IPO sofa. This luxurious RV boasts an impressive list of standard features that include a 20K lb. hitch, LED headlights, In-Dash Garmin RV navigation, Mobileye Collision Avoidance system, JBL Premium cab sound system, tire pressure monitoring system, dual-stage C brake, powder and liquid coated steel frame chassis, full coverage heavy duty undercoating, chrome power mirrors with heat, front and rear fiberglass cap, four point fully automatic hydraulic leveling system, keyless pad at entry door, roof-mounted integrated armless patio awning with LED lighting, ultra leather furniture, coordinating fabric window treatments and lambrequins with hardwood and crown, day/night roller shades, quartz counter tops, Blu-Ray home theater system in living area, Corian shower with glass door, LED flush-mount ceiling lights, 50 amp power cord reel, 3,000W inverter, 8KW Onan generator with AGS and auto transfer switch, diesel Aqua Hot, multiplex wiring, macerator system, whole coach water purification system and much more. For more complete details on this unit and our entire inventory including brochures, window sticker, videos, photos, reviews & testimonials as well as additional information about Motor Home Specialist and our manufacturers please visit us at or call 800-335-6054. At Motor Home Specialist, we DO NOT charge any prep or orientation fees like you will find at other dealerships. All sale prices include a 200-point inspection, interior & exterior wash, detail service and a fully automated high-pressure rain booth test and coach wash that is a standout service unlike that of any other in the industry. You will also receive a thorough coach orientation with an MHSRV technician, an RV Starter's kit, a night stay in our delivery park featuring landscaped and covered pads with full hook-ups and much more! Read Thousands upon Thousands of 5-Star Reviews at and See What They Had to Say About Their Experience at Motor Home Specialist. WHY PAY MORE?... WHY SETTLE FOR LESS? Check out Stock # FDM021979319 - 2020 Dynamax Corp Dynaquest XL 3801TS on dynamaxrvs.com!